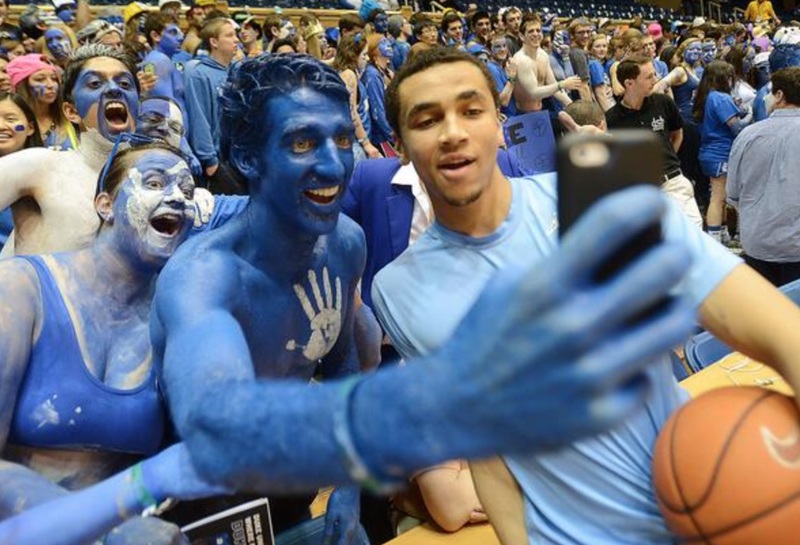 The Cameron Crazies magnanimously congratulate North Carolina’s Marcus Paige on his team’s upcoming No. 1 ranking. This is merely a prediction, mind you, not a ranking of my own top 10. Still, I’m feeling pretty confident about the membership (if not the exact sequence) of this group and particularly the top seven. In fact if someone other than these seven teams shows up in the AP’s first poll ranked between Nos. 1 and 7, I owe you all a beer. Maybe I’ll do this every September — if nothing else it’s easily evaluated. I’ll dock myself one point for every spot I’m off the mark with a given team. A perfect score’s a zero. In other news, Gonzaga, Arizona and Michigan State will head up the second 10. So much for prognosticating. One question that occurs to me as I peer into the future of the AP poll is why North Carolina and Kansas are going to be seen as such wholly different quantities. After all, the Jayhawks posted a slightly better efficiency margin than did the Heels, and the guys in Lawrence did so in a slightly better league. True, KU lost Kelly Oubre and the never-entirely-there Cliff Alexander, but UNC lost J.P. Tokoto — as a result both 2015-16 rosters are essentially identical when it comes to experience (as measured in returning possession-minutes). Lastly Bill Self’s crop of freshmen is superior to Roy Williams’ bunch even assuming Cheick Diallo never gets his eligibility thing straightened out. And if Diallo does get on the floor at some point, KU and California will be essentially tied, by my lights, for the honor of claiming the nation’s No. 4-ranked freshman class behind Kentucky, Duke and LSU. So why the discrepancy between Carolina and Kansas in the (yet to materialize but oh so accurately forecasted) rankings? Just curious. This entry was posted in counting things, hoops on September 1, 2015 by johngasaway.